How can I access the AJAX web interface of PRTG with Internet Explorer 9 or IE10? Although I load the AJAX Web GUI of PRTG with IE9, the login option AJAX Web GUI (All features, optimized for desktop access) is shown in gray color and the login fails. There is a message that my browser is not supported and after login the web interface has a “strange” appearance. If you use Internet Explorer 11 (we do not recommend that), please also use security level medium-high (or lower) and do not enable any compatibility mode. The steps are similar to IE10, as described below. Due to the complex scripting capabilities of the PRTG web interface, we recommend using Google Chrome or Mozilla Firefox for best performance. If you, however, use Internet Explorer (IE9 or IE10), it is important that you ensure the following settings. Please follow Step 1 below to solve this issue. Make sure the security level is set to Medium-high or lower. With a higher security level your login will fail. Please follow Step 2 below to solve this issue. Do not use compatibility view of your Internet Explorer for PRTG’s web GUI. Usually this option is not set for PRTG, standard is IE9 resp. IE10. If for some reason this view is enabled, follow the steps below. To disable Compatibility View for the website that is currently viewed, open IE’s developer tools with the shortcut key F12. Click on Browser Mode and choose the entry IE9 resp. IE10. As Document Mode, choose IE9 standards resp. Standards. 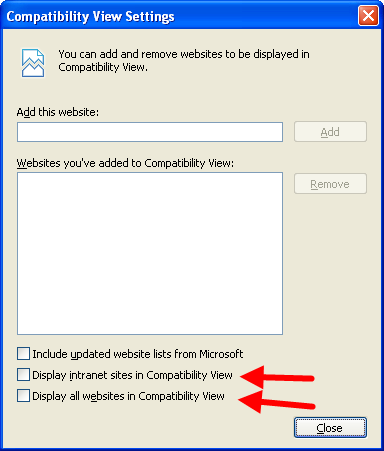 Also make sure that no compatibility views are enabled for intranet sites or all websites in the Compatibility View Settings. You can edit these settings under Tools | Compatibility View settings. Note: To view the bar with the entry Tools, right-click the top bar of your IE and click Menu bar. Select Tools | Internet Options from IE’s menu. Select the Security tab. For the Internet zone, set the security level to Default level Medium-high or lower and confirm with OK. Note: If you do not want to change your security level for the Internet zone, add your PRTG’s IP address and/or DNS name to the Trusted sites and change this zone’s security settings accordingly.